This is a wonderful, lightweight coverlet, perfect for between seasons, or in winter with an added blanket. The amount of detail in the stitching is exquisite, so that the pattern is one that is exceptionally beautiful. I washed it on first arriving and it washed and dried up wonderfully, adding just that more bit of detail to the pattern. I am sleeping under it every night and just love it. I highly recommend this product. A lovely accent to your favorite bedding, the Hampton White Matelasse is a perfectly weighted coverlet for year-round comfort. In a crisp shade of white with the textured matelasse construction, there's no questioning its stylish appeal. 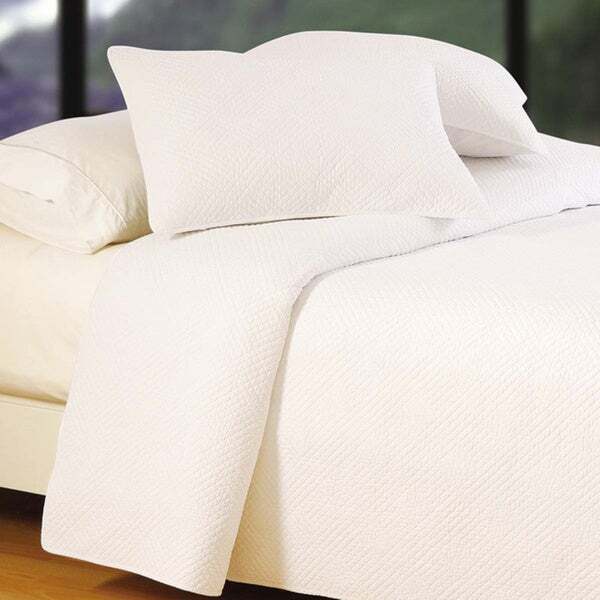 Machine washable for easy care, the coordinating standard sham and Euro Sham are available for purchase separately. I am disappointed with this quilt as some of the seams are starting to loosen up and I haven't had it very long at all. It's barely even used. Also it says it's all cotton but it's not all cotton it's also polyester. If I had kept the receipts and realize that it wasn't all cotton till later I would have returned it. It's very heavy and unlike a cotton quilt . Looks great! Very pleased! Looks exactly as expected and quality is totally top notch I would definitely purchase this product again in the future since its such a great deal! This quilt is pre-washed and shrunk. "Is this item a pure white color or off white?" Hello pained, the color is more off-white in my opinion. Please let us know if you have additional questions. Thanks for shopping with us. Hello kabbv, this quilt is reversible. Thanks for shopping with us!